A community project which up-cycles furniture is providing tailored support for people who need more help to undertake active and effective job seeking. The GWK Charity Shop on James Street in Workington was set up by social enterprise, Groundwork North East & Cumbria, to support the long term unemployed and those from disadvantaged backgrounds, through training opportunities and progression into further education, employment or volunteering. 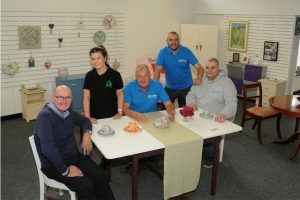 Volunteers repair and refurbish donated furniture and household goods to be sold at affordable prices to those who may not be able to buy what they need brand new. Peter Doherty, from Maryport is a regular volunteer. He said: “I like making things, it keeps me occupied and I would just get bored at home. There must be hundreds of pieces of furniture that need repairing or refurbishing and people can bring it here as we offer that service.” During his time at GWK, Peter has been involved many projects including turning wardrobes into storage boxes and pallets into garden benches. Run by volunteers, the shop is open from 9am to 4pm Monday to Friday and 9am to 1pm on a Saturday. A large number of the customers are unemployed, elderly and disabled. It offers a delivery service for larger items and is looking to open a drop-in café for locals and visitors. Due to an increase in demand, a £500 grant from the Cumbria Fund provided training for more volunteers to produce more goods.